A man I consider to be a Hall of Fame caliber artist has a new exhibit at the Country Music Hall of Fame & Museum, and I bet it won’t be his last. 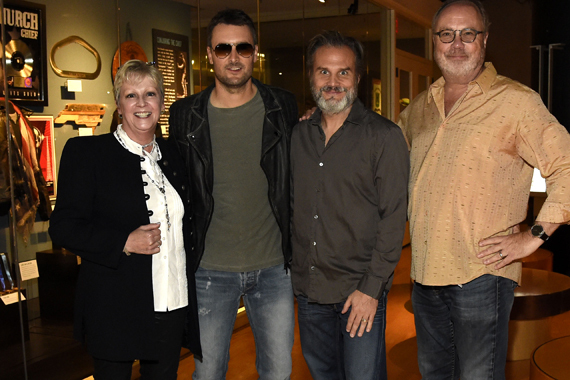 The museum hosted a preview party on Thursday evening (9/17) for “Eric Church: Inside the Outsider.” It’s just a pocket exhibit, but the star was enormously moved by the gesture. “I just want to say I grew up as a fan,” said honoree Eric Church at the reception in the Library Reading Room. “I revere country music. I remember walking by the Country Music Hall of Fame and having a ‘moment.’ I was a songwriter who had been told ‘No’ a bunch. “I just walked through an exhibit that had my name on it,” he added with emotion in his voice. “I can’t believe how far we’ve come. “I’ve learned one thing: It’s not about me. It’s about the people in this room. I can’t say how much I love each and every one of you. John Peets, Mike Dungan, Troy Tomlinson, Arturo Buenahora, Jody Williams, and Donna Hughes were just a few of the Church team members in attendance. They applauded alongside Chris Horsnell, Kelsey Grady, Lori Badgett, Scott Stem, Vernell Hackett, Holly George Warren, Hunter Kelly, Bob Paxman and Charlie Cook. “He took his songs to the People and put on shows full of raw energy,” said the senior vice president of museum services Carolyn Tate to the crowd.“Eric converted his fans one club at a time, one theater at a time and finally one arena at a time. “Thank you for letting us tell your story. We believe this is just the first chapter in a long and very significant career.” My sentiments, exactly. The pocket exhibit contains stage outfits, hand-written song lyrics, awards, a set list, an autographed George Strait guitar, photographs and other career memorabilia. Between this, the “Dylan, Cash & The Nashville Cats” exhibit and the “Flying Saucers Rock & Roll: Sam Phillips” exhibit, the Hall of Fame is a must-visit more than ever. Go.